Neva Verneil Besco Stephens, daughter of Henry Besco and Ethel Deaver, was born May 15, 1922 near Platteville, Taylor Co., Iowa and died May 14, 2005 in Bedford, Taylor Co., Iowa. 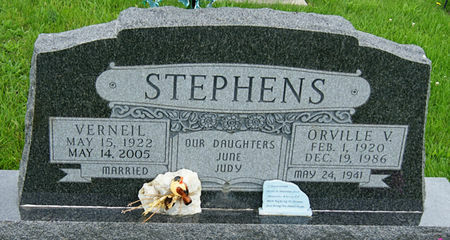 She married Orville Vinning Stephens May 24, 1941 at Maryville, Nodaway Co., Missouri. He was born Feb. 1, 1920 in Bedford, Taylor Co., Iowa, son of Vennie Gordon Stephens and Pearl Rose Patch, and died Dec. 19, 1986 in Bedford, Taylor Co., Iowa. Searching for NEVA VERNEIL BESCO STEPHENS in Taylor County Iowa?